Grand Cayman’s first-ever lifestyle resort, Kimpton Seafire Resort + Spa, is a state-of-the-art wonder on world-famous Seven Mile Beach, bringing sea and sand into view the moment you arrive. Our open-air design stays with you indoors and out, with water vistas at every turn, and winding gardens that lead to secret sanctuaries, social gathering places, pristine pools and of course, the Caribbean Sea. 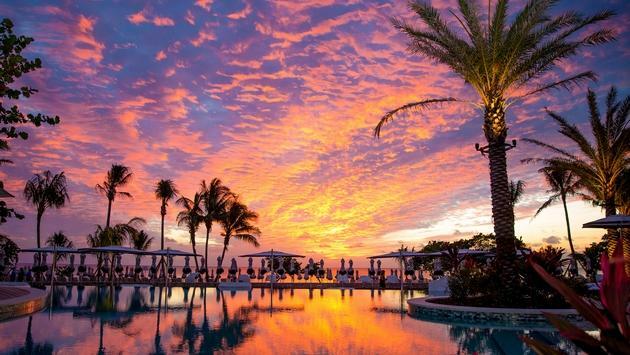 Enjoy front-row seats to glorious sunsets that seem to set the ocean ablaze. Thus our name, Seafire. European Plan. Rate is subject to a nightly 13% tax, daily $70 resort fee and nightly 10% service fee. IATA number will be required to process the reservation. Non-commissionable rate. See hotel’s cancelation policy to avoid penalty fees. Rate will be offered subject to availability. Limited offer.